Welcome all, to a magycal land of dragons, adventures and good fun! Book 5 of the Guardians of the Path series is now available for your reading pleasure! The object which shielded Demona from Demons for centuries is broken, the Path is fading, and the Guardians are in hiding. 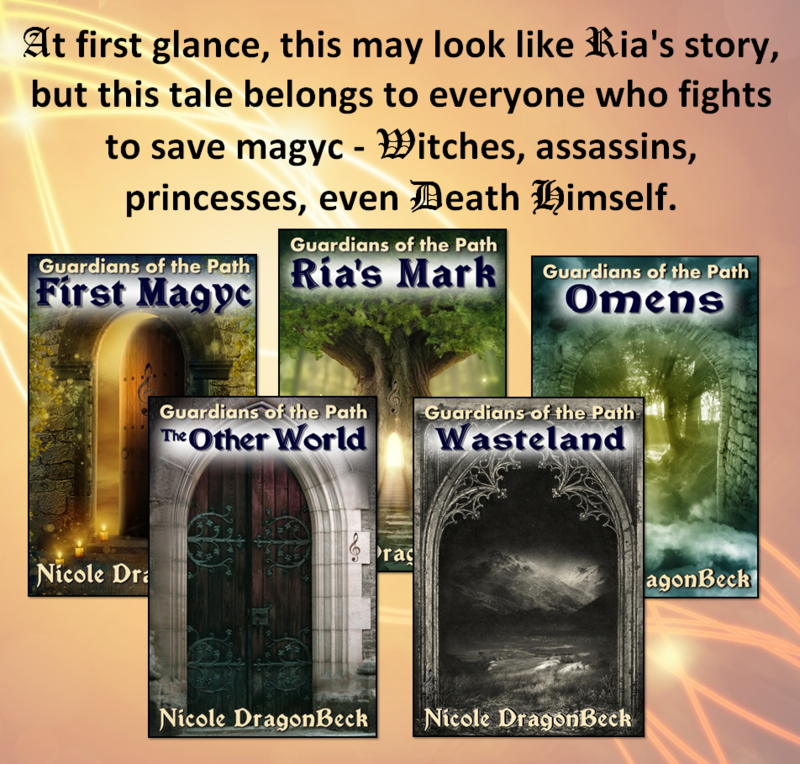 When Ria finds her way to this new world of music and magyc by helping the Guardian Cedar Jal escape his prison between worlds, she becomes caught up in his struggle, and discovers she may be the answer the Guardians need. Cedar doesn’t want Ria to be the one named and fated to die in the Prophecy, but what if she is the only hope to defeat the Sorcerer, rekindle the Path, and and save Demona? You can check out the series here!! Nicole DragonBeck was born in California one snowy summer long ago, the illegitimate offspring of an elf and a troll. At a young age her powers exploded and she was banished to the wilderness of South Africa because her spells kept going inexplicably awry. There she was raised by a tribe of pygmy Dragons and had tremendous adventures, including defeating a terrible Fire-Demon that had been tormenting a sect of Dwarf priests. In gratitude they taught her the arcane magic of writing and the rest is horribly misinterpreted history. She reads as much as she writes, is obsessed with dragons and Italians, enjoys cooking, listening to music and can often be heard fiddling on a keyboard or guitar. She currently lives in Clearwater, Florida, is a member of The Ink Slingers’ Guild and is working on several novels, all of which have at least one mention of a dragon. She lists friends, music and life among her greatest influences. After reading this bio, I’m inclined to go re-write my own! Magycal and mystical world. Hey, you are a dream. Dragons and Italians? I like you already!